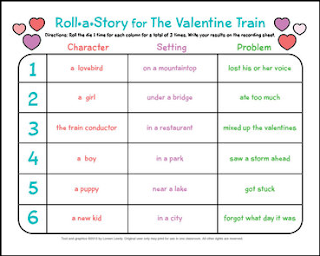 All aboard for The Valentine Train Roll a Story! Where is the Valentine Train going? What happens if the valentines get mixed up? What if the conductor forgets that it's Valentine's Day? It's up to your students to figure out how the story will go. Your kiddos will enjoy rolling the dice to see what character, setting, and problem they'll have to work with. Their results go on the recording sheet as well as their ideas and drawings. This activity should have them raring to write their final story. 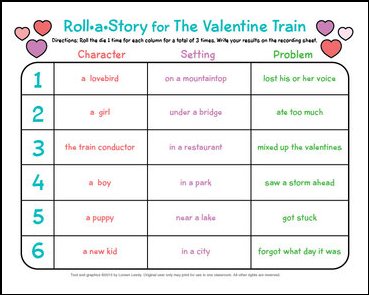 Companion products include The Valentine Train Mini-book and The Valentine Train printable card. Also available at a discount: The Valentine Train Card and Mini-book Combo Pack. Click here to see all my Valentine's Day activities.